Nash Baker Architects have extensive experience in the high end residential market, where we can add value and offer expertise. Our experience in planning and design provides a significant advantage in maximising outcomes in residential development. We offer a bespoke range of services for property developers which can be tailored to meet the level of service you require for your project. These services range from inception to completion, and aim to help you realise the potential of each and every site. We understand the fast-pace of development projects, and are experienced in resolving challenging sites to create viable, buildable designs. Strategic Advice: Nash Baker can provide advisory services to help with strategic decision making and stakeholder consultation; design brief development; budget-setting; procurement procedures and the appraisal of design proposals. Feasibility Studies. Working with you to assess potential development opportunities and advise on viability and potential. This service can evaluate the factors which may affect your project including planning potential/restrictions, buildability, rights of light, costs, programme, restrictive covenants and we can also provide preliminary layouts and concepts. Planning permission: Our in-depth knowledge of planning means we are well placed to advise on planning strategies for complex and challenging developments. If required, we will assemble and lead the consultant team to ensure these applications are as thorough and complete as necessary; ensuring that permissions are obtained as promptly as possible. Listed Building Consent: We pride ourselves on our expertise and track-record with listed buildings, and enjoy working with these unique cultural assets. As development sites, they can be some of the most complex; we can help you navigate the approval process to ensure works commence as swiftly as possible. Building Control: Working with the rest of the consultant team we can resolve the technical design and obtain your Pre-Plans Building Regulation approval. 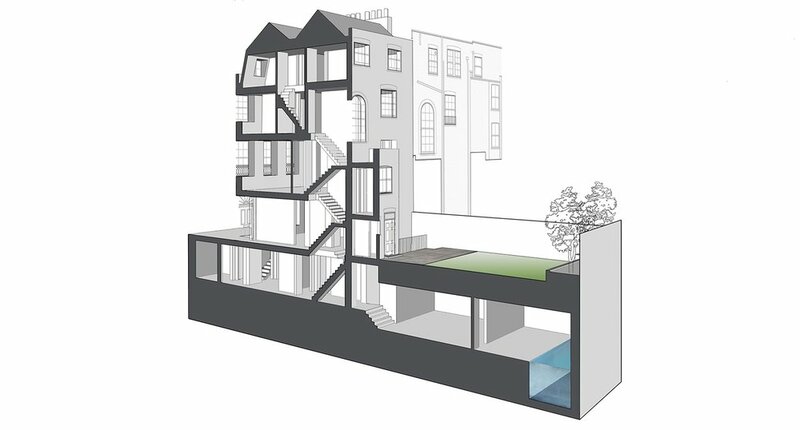 This would typically include developing the design to address current building regulation requirements (such as, structure, drainage, fire, acoustic, ventilation, energy etc.) prior to works commencing on site. Technical and Construction Information: We can provide a full detailed set of construction drawings and schedules for tender or construction purposes. Some of our builder/developer clients prefer a partial service (sometimes referred to as an enhanced building regulations package) which would typically include, construction details, lighting layouts, small power layouts, bathroom layouts and door & window schedules. We are also able to offer detailed design services for specialist works such as staircase design, fitted joinery, and setting-out drawings for finishes. Project Management/ Contract Administration: Your development will be in safe hands with one of Nash Baker’s team of experienced architects leading your project. All fees are negotiable and can be structured to suit your needs; including time-charge, lump sum, percentage of build cost, or even performance based.